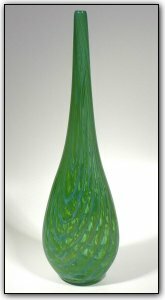 This vase is a translucent green with blue shading, and stands just shy of two feet tall. The base is 7" x 4.5" and it tapers to a skinny opening at the top. This stunning vase would be perfect for flowers, or for simply displaying alone.